When water is referred to as ‘hard’ this simply means that it contains a higher concentration of minerals than ordinary water (these being most particularly calcium and magnesium); the distribution of ‘hard water’ areas is generally linked to local geological conditions. (A map indicating Water Hardness in the UK and Ireland is located in the Technical Library). The degree of hardness of the water increases, as more calcium and magnesium dissolves. Hard water not only makes washing with soaps and detergents difficult and costly but when hard water is heated, the calcium and magnesium salts become insoluble, forming limescale on the heat transfer surface. If this is not dealt with effectively, it can soon incur increased energy costs, acting as insulation, thus reducing the heating or cooling efficiency of affected appliances such as Boilers, Humidifiers, Dishwashers, Washing Machines, and other treated water processes such as Reverse Osmosis and ElectroDeionisation (EDI) systems. Limescale can also cause increased wear and overheating with potentially disastrous consequences. (See video posted on AWT NEWS). For this reason, it is paramount that an efficient water softener system is installed as part of any feed water treatment system. A water softener system is a well-established and extremely reliable solution for hard water problems. The water softener units contain an ion exchange resin, which effectively replaces the ‘hard’ salts of Calcium and Magnesium for ‘soft’ salts of sodium, therefore stopping limescale from forming and building up. Where small volumes of softened water are required on a non-continuous basis, and space is at a premium, a compact cabinet style water softener may offer the perfect solution. Simplex Water Softeners are best suited to applications where there is a steady demand for moderate capacities of softened water over the course of a normal working day. Duplex softeners are ideal for sites with varying water demand or for applications where a continuous and uninterrupted supply of softened water is required. During the softening process, water is passed through a column of ion exchange resin. The calcium and magnesium ions present in the water are ‘exchanged’ on the resin beads for an equivalent amount of sodium ion. This is known as the ‘ion exchange’ process. The exchange of hardness for sodium is finite however and a small amount of ‘hardness’ usually passes through the softener in the treated water. Testing of the softened water discharging from a properly operating softener unit for hardness at this stage will usually not detect the trace amount of hardness. At some stage, it will be necessary to rejuvenate or regenerate the resin so that the quality of the softened water can be maintained. Regeneration of the resin is achieved by passing a solution of brine through the resin bed to displace the calcium and magnesium ions that have been taken up by the resin beads from the water. The sodium from the brine replaces the calcium and magnesium ions on the resin. Once this process is complete, the resin can be put back into service to soften the incoming water. Production of a suitably ‘saturated’ brine solution normally takes up to 6 hours and this should be considered when sizing a water softener. If the salt concentration is too low, poor regeneration will occur resulting in poor displacement of hardness and poor quality water. What is a simplex water softener? A simplex water softener consists of one vessel containing ion exchange resin. 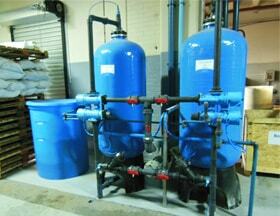 Once the ion exchange resins are exhausted, the water softener will go into the regeneration sequence. During the regeneration sequence, there will be no water passed through the softener to service. 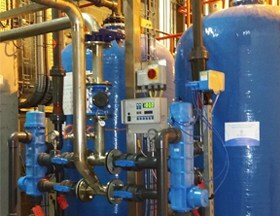 If the water softener is time controlled, it is possible to set the regeneration to a time when there is usually no requirement for water however if the water softener is a water meter controlled unit, it is more difficult to gauge what time the water softener will regenerate and this interruption to supply may create issues. 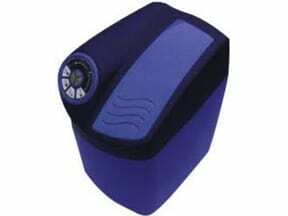 If a continuous supply of softened water is required therefore it is advisable to opt for a duplex water softener. 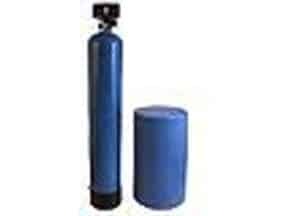 What is a duplex water softener? A duplex water softener consists of two vessels containing ion exchange resin; once the first column of resin has exhausted and goes into regeneration, the second column goes into service. This maintains soft water to service at all times. To ensure maximum efficiency, the regeneration cycle for a duplex water softeners would normally be activated on a meter controlled (volume) basis.